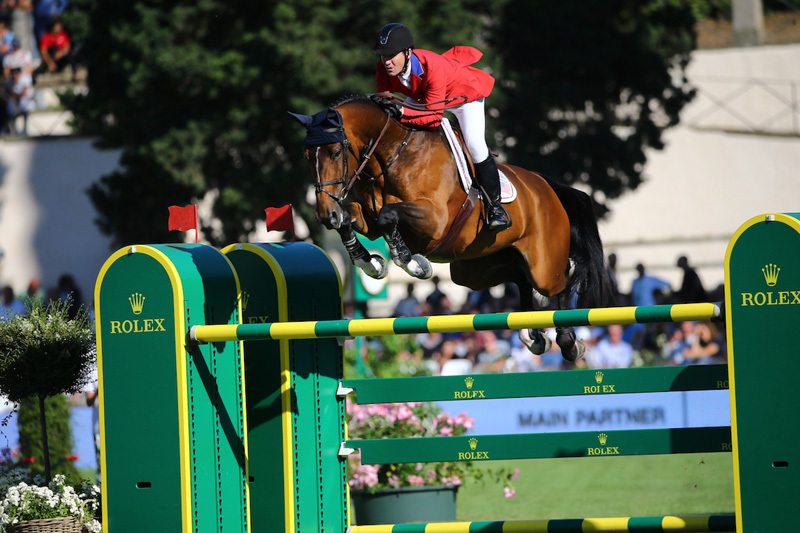 The NetJets U.S. Show Jumping Team of Laura Kraut, Spencer Smith, Beezie Madden, and McLain Ward earned the silver medal with 8 faults at the FEI Jumping Nations Cup CSIO***** Rome on Friday, May 25. Switzerland tied with the U.S. for the silver, finishing with 8 faults, while the Italian team scored a home win with 4 faults. Laura Krautand St. Bride’s Farm’s 11-year-old Holsteiner gelding Confu were the pathfinders for the U.S. team and set the tone with a clear round in Round 1. Spencer Smith, riding on his first senior Nations Cup team for the U.S., rode Ashland Farm’s Theodore Manciais, an 11-year-old Selle Francais gelding, to 8 faults in the first round, which served as the drop score. Beezie Madden and Abigail Wexner’s 10-year-old Holsteiner gelding Coach and McLain Ward on Francois Mathy and Double H Farm’s 12-year-old Belgian Warmblood mare HH Azur closed out the U.S. team’s first round effort with clean trips, allowing the team to conclude the first round with a score of 0 faults, making a tie for the lead with the Swiss and Italian teams. Kraut led the U.S. team into the second round with just a rail at the penultimate fence for a score of 4 faults. Smith put another 8 faults on the scoreboard, and then Madden and Coach incurred a foot in the water for 4 faults. Ward’s clear second round put the U.S. team on an eight-fault total. The Swiss team had a clear round at the start of the second round. Three rails put them on an eight-fault total, tied with the U.S. The last rider of the class, Italian Bruno Chimirri, turned in a clear round to clinch the win for Italy. The U.S. and Swiss teams shared the podium for the silver medal. See the full results of the FEI Jumping Nations Cup™ CSIO5* Rome.